in the town of Berlanga they have garnered lodging. The Song of el Cid, verses 2875 et seq. 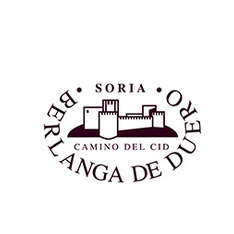 According to the General Chronicle of 1344, El Cid was mayor of Berlanga de Duero. This manor would have been granted to him in 1089 by Alfonso VI as a payment for his services. According to the poem Cantar de Mío Cid , Berlanga is a safe village where the daughters of El Cid stayed when returning to Valencia. The village, along with other Sorian towns of the Camino del Cid, was a part of the defensive line of the Duero river in the 11th century, and is an essential visit in this section of the Camino. Among its attractions, it includes its Renaissance-style castle -sitting on a previous one from the 12th century-, the former 16th century collegiate church, and the gastronomy. Today, to enter the castle, you have to go to the Town Hall or the Tourism Office of Berlanga de Duero since visiting hours change during the year. The former collegiate church is "guarded" by a singular "watchman": an alligator of more than three meters that Fray Tomás de Berlanga - a friar from the 15th century - took to tBerlanga after his trip to the Galapagos Islands which, according to various sources, he himself discovered. The former collegiate surprises by the beauty and balance of its forms. Very close to Berlanga is the Mozarab hermitage of San Baudelio de Berlanga, a must visit for its architecture and murals -part of which are in the Metropolitan Museum of New York-, as well as the medieval walled town of Rello, so Berlanga is a place of departure and rest to other points of interest in the area.